You’ve read all about design sprints and you’re ready to hit the ground running. However, there are a few key things that you need to make sure it’s a success. You need the right people, you need an appropriate space, and you definitely need the right tools. While working at CDK Global I wanted my team to have easy access to the tools they needed to properly run design sprints. 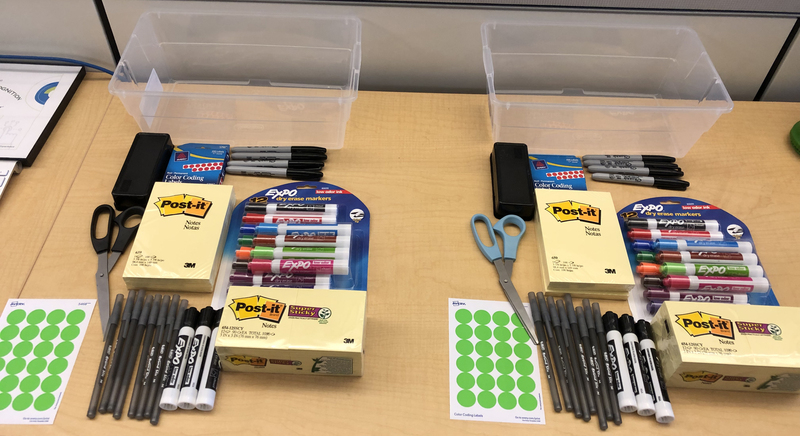 This simple set of tools also became the base set for any workshop we planned on running whether it was a few hours, or if it was a design sprint spanning across 5 days. We ended up building two “sprint boxes” that were something designers could just grab and go with. Toss them all in a box, and you get something that is easy to grab and go with. After building out two sprint boxes we left the remaining supplies in my desk drawer and would refill the kits as needed. There are plenty of ways to build out a quick sprint box, but utilizing the list above will get you everything you need to run a design sprint, and the same set of items will also let you run most design workshops. I hope you all enjoy building out your different kits and happy sprinting! As an Amazon Associate I earn from qualifying purchases, but regardless of how you get the items these are definitely the go-to and what I’ve used in the past.